Canadians are telling pollsters that they intend to spend more money this year than last. $653 on gifts this year (up about $100 from last year) according to a survey by RetailMeNot. $643 on holiday shopping (up 8% from last year) according to a CIBC survey. The polls ask the questions slightly differently but across time come to the same conclusion. The idea that we will spend more on the holidays this year is a broad reflection of the fact that economic confidence is strong as we wind down 2017 according to the Bloomberg-Nanos Economic Confidence Index. Of course, Canadians seem addicted to spending money they don’t have given the high level of personal debt. 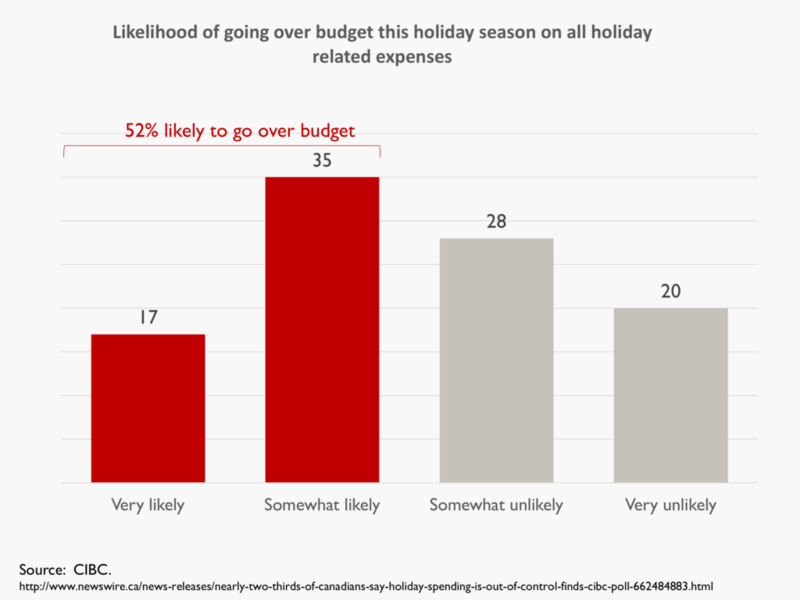 Not only are Canadians expecting to spend more, but many admitted they are likely to go over budget. In fact, 17% are very likely to do so another another 35% are somewhat likely. For additional reporting on the CIBC poll see the Globe and Mail story.